Doing what I want when I want to, going on a holiday without getting approval from anyone or living in more than one town in a year, waking up at the time I want to, following my passions and off course writing and blogging as I please. These and a lot more statements sum up what financial independence means to me. It’s what I work to achieve every day. Its also what I preach in this blog. My chat with my very close cousin brought this whole financial freedom vibe to me. My friend, older than me is a lawyer and a great woman. She has done very well climbing the corporate ladder whilst raising her child by herself. She loves cars as much as I do. The difference is that, I admire them and never imagine paying the installment (I never had a car installment in my life). My friend drives them, and works hard to do so. So, last week we catch up on WhatsApp. She was traveling on a business trip. Our chat swayed towards the topic of retirement. She mentioned the amount she thinks she has for her fast approaching retirement, but she has never been a details person, and doesn’t know the exact figure. She then asked if I think it’s enough. And my response: NO ITS NOT ENOUGH!!! Which probably shook her a bit. Apart from the fact that I think the figure is low, her lifestyle could be working against her. R1Million, R3Million, R5Million or any other figure would do just fine for one person but not the other. It depends on someone’s lifestyle choices. In my case, whilst I love a big open space, airy home with a gym, games room, and all other unnecessary extras, we choose not to have all of that. We decided to go modest and live right where we are. We prioritised what we consider safe and embraced estate living in our smaller than we wish house. We don’t even have fancy “his and hers” office spaces, no separate laundry room, no pantry. I want a walk in closet so desperately but we are doing just fine without it. Don’t get me wrong though, its not bad to have all the stuff I mentioned. The point is that, I do not have to have EVERYTHING I like and want. I may eventually get a house slightly bigger that the one we currently have. But that is not a priority at the moment. When we hit our target net worth, we may decide to put our current house on the market for rental and buy us a bigger place. Even then, it would not be necessary. The bigger the space, the higher the costs for maintenance, mortgage, rates and taxes, furniture and appliances. I would love to drive my dream car. It’s not cheap, not economic, and its definitely not worth my financial freedom. Even choosing not to buy the car is a sign of freedom. The choice not to ever have a car installment. If having my dream car now would interfere with my financial plan, its postponed. I choose earlier financial freedom to a fancier car or a bigger house. Sounds very easy, but in reality it’s not. Affording a luxury is when you can have it without interfering with your retirement provision. It is not about having access to cash to fund the luxury. Whilst I am no fan of dining out, I love great food. I love my fresh organic produce. And I want it prepared in the safety of my own home. Does that sound bad? Food is meant to fuel our bodies. The healthier the better. I don’t need to be in a fancy formal wear restaurant to get the best food. It could be because of my food issues, but I'm very glad to eat in everyday. When I do go to dine out, I get miserable, and never get the food that my body needs. I am on a special diet, which I think helps. Now back to my good friend. I didn’t blurb all this to her but I hinted about my love for all this fancy stuff and priorities. I mentioned the car for cash idea and she confessed to being depressed after the chat. Am I happy that she is depressed? NO. Am I happy I talked to her about this stuff? YEP. She says she will be working harder on her retirement finances. We are now all happy! 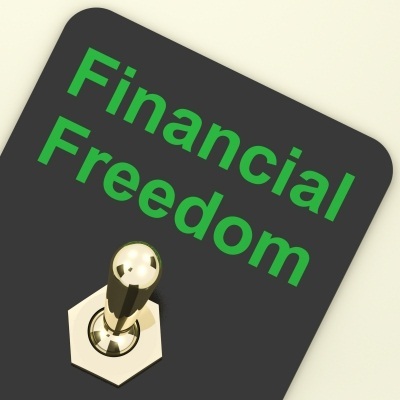 I would love to know what financial independence means to you, how important it is and what you are prepared to sacrifice to get to your freedom.